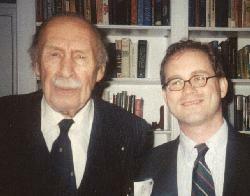 Left is the beloved European commentator--and my inspiration as a writer--Erik Ritter von Kuenhelt Leddihn, whom I was privileged to meet before his untimely death. Slightly to the right there's me--in 1999. 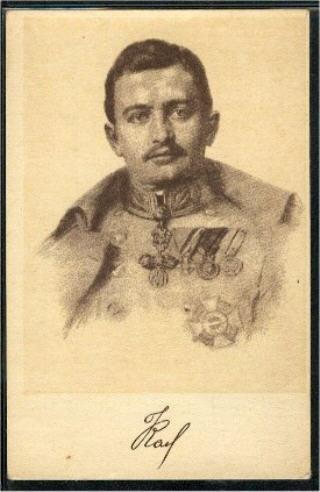 Here is an image of the Last Emperor, the good and holy Karl I. "Gott erhalte Karl den Kaiser, unsern guten Kaiser Karl...!" Why the Left/Right spectrum has ceased to mean anything, and what should replace it. The U.S. harnesses Nazgul as anti-terror weapons. Why true friends of Israel should oppose the settlers and Likud. The true origins of Western freedom. Documentation of war crimes committed in Gulf War I. The prudential case for staying out of Iraq. When a Catholic traditionalist goes to World Youth Day, his reflections are worthy of C.S. Lewis' devil. Why democratic governance would destroy the Catholic Church. If we don't, then we really ARE anti-semites. Is there a new "two-track" system of salvation? Rembert Weakland's gay legacy in the sanctuary. A professional ex-Catholic willfully misleads, again. Bill Keller of the Times dances prematurely on John Paul's grave. What's so special--even uncanny--about the priesthood. They include every good priest who'll now have to shun children. The corruption of the sexual instinct runs deep. A truly patriotic film for 2003. Go see it before the censors shut it down. Gods & Generals, a truthful history of the Civil War. The Lord of the Rings is a tribute to the Teutonic roots of liberty--and a refutation of Nazi ideology. A famous free-market libertarian on the need for stable borders. Why religious-minded immigrants won't save the U.S. from paganism. A Cool-Headed Critique of Cold-War Conservatism (Neoconservatism and other varieties). Wherein Christopher Hitchens awakens from an opiate haze to call me an anti-Semite, and I respond. Worldwide, Islamists target Christians, Jews, and others in their midst. Unless we repopulate the West, it will soon look like the Middle East. Why animal rights leads to cannibalism. Why insult the skyline (and mock the dead) with another post-Bauhaus megalith? Disregard of the environment is an ugly modern heresy. Why Japanese food is leftist, and French food of the Right. How the death penalty affirms the sanctity of life. The model of democracy (in the positive sense) stands in the Alps. Remembering the currency that helped save Europe. Why I'm STILL pissed off over the French Revolution. Say It Loud—Bourgeois and Proud! In defense of middle-class prejudices. Behind the Irish Curtain: Who is this Guy and Where's His Therapist? Invest their college fund in Bingo cards and bourbon. Fearless, eclectic, and always scathingly honest reflections from a libertarian patriot. One brave writer's reflections on science, nature, and ideology. Peter Brimelow's gallant, Quixotic attempt to rally the West. The only interesting rock band alive. It also claims to be a global, transnational, purely voluntary State. Notes, essays, reviews, and corruscating bile from a high-tech blue-collar Habsburg monarchist Yalie. With a beagle.